Celebrating Landscape Photography Blogger’s 200th Blog Post! White Domes, Valley of Fire State Park, Mojave Desert, Nevada, copyright 1970 by Philip Hyde. Cover Photograph of “Drylands: The Deserts of North America.” Color Transparency: 4X5 Baby Deardorff View Camera. Dye Transfer Prints, Cibachrome Prints, and Archival Digital Prints. See PhilipHyde.com for Image Info and pricing. This bare bones definition needs expanding. For one thing, barrenness, like beauty, is in the eye of the beholder. Ancients regarded the desert as a place to avoid—literally, to desert. 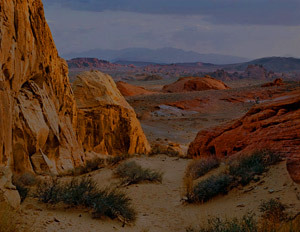 The biblical “waste-howling wilderness” is a description of the Middle Eastern desert, a fearful place for most people. But even then it was for some a place for contemplation, a retreat from the cares of daily life. In our times, the desert is commonly a refuge, though we can be grateful that the deserts of North America were avoided by so many early travelers, and thereby protected. More recently, parts of these great deserts have become increasingly attractive to sun-worshipers. It is an irony that the climate, attractive to so many people, is being gradually altered by air pollution generated by population growth and its attendant requirements for industries and automobiles. Webster’s definition doesn’t explain the aridity of the desert. High mountain chains intercept moisture-laden storms, keeping rainfall from the land in the lee of the mountains. Wind also contributes to desert dryness. A map plotting the course of trade winds in relation to deserts around the globe would show most arid lands to lie in the path of the trades. Though our deserts are not as directly in the path of the trades as some, strong winds persist over most of them for long periods, particularly in the spring. The North American deserts are unlike most deserts in that they are not confined to the interior of the continent. They reach to the sea on both coasts of the Baja California peninsula and along the west coast of mainland Mexico as well, creating some unusual meetings of desert and water. During the midday hours the cliffs seem to wilt and drop as if retracting their grandeur to hide it from the merciless radiance of the sun whose very effulgence flouts them. Even the colors are ruined. The glaring face of the wall, where the light falls full upon it, wears a scorched, overbaked, discharged look; and where the dense black shadows are thrown—for there are no middle shades—the magical haze of the desert shines forth with a weird, metallic glow which has no color in it. But as the sun declines there comes a revival. The half-tones at length appear, bringing into relief the component masses; the amphitheaters recede into suggestive distances; the salients silently advance toward us; the distorted lines range themselves into true perspective; the deformed curves come back to their proper sweep; the angles grow clean and sharp; and the whole cliff arouses from lethargy and erects itself in grandeur and power as if conscious of its own majesty. Back also come the colors, and as the sun is about to sink they glow with an intense vermilion that seems to be an intrinsic luster emanating from the rocks themselves. The stone landscape of which Clarence Dutton writes might appear austere and unfriendly to the casual traveler suddenly thrust into it. 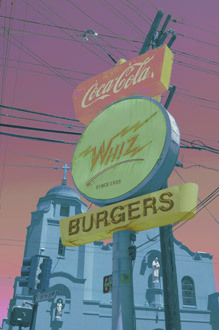 Many people would not recognize it as a part of their familiar world, but something about the place immediately appealed to me. Perhaps it struck some of the same harmonic notes evoked by the clean expanses of granite in the High Sierra Nevada I had learned to love in my youth. The place spoke to me of the same kind of purity that Ralph Waldo Emerson was alluding to when he wrote of the integrity of natural objects. As a forest dweller and desert traveler, I am especially aware of the contrasts between an arid landscape and one that is well watered. The creek that flows beneath my window as I write; the groundcover, trees, shrubs, and flowering plants; the seasonal and atmospheric changes I observe here are all expressions of water abundance. In the desert it isn’t just the paucity of water that impresses me. I am delighted to discover water’s surprising, often beautiful presence in hidden places, as for example, the spring in Monument Valley that flows from beneath a high sand dune—or those few, small, spring-fed pools surrounded by the vast, sere, rocky landscape of Death Valley. Marble Gorge, Grand Canyon National Park, 1964, by Philip Hyde. From Navajo Wildlands, Sierra Club Books. Two miles from proposed Marble Canyon Dam site. *Landscape Photography Blogger Note: Clarence Dutton was like the ‘John Muir’ of the Grand Canyon and Colorado Plateau. As you look to explore the Colorado Plateau yourself, please be aware that the areas where people are allowed and the approaches to them have changed since 1965, especially in Canyon De Chelly National Monument. Also note that the politically correct term for the native people now is their own word, “Dineh,” in its various spellings, rather than the Spanish word “Navajo,” in common practice then. When Clarence Dutton explored the Plateau Province a hundred years ago, he saw that a visitor conditioned to the Alps, if he stayed long in this new country, would be shocked, oppressed, or horrified. While in Dutton’s days emotion about scenery was still all right, today, indifference is popular, and we tend to take someone else’s opinion about what is beautiful and flock to the recommended places. Noting this, Aldo Leopold, in A Sand County Almanac has identified the “trophy recreationist,” and urges that recreational development is “not a job of building roads into lovely country, but of building receptivity into the…human mind.” Indeed, a great increase in individual sensitivity might be achieved if park authorities spent as much effort on interpretation as on road building. We had reached Newcomb, about halfway between Shiprock and Gallup, crossing the Chuska Mountains on a magnificent little dirt road. It wandered in the pine forest on top, discovered little aspen-ringed ponds, and found us a superb view of Shiprock, fifty miles to the northeast. It also climaxed our afternoon with an enormous thunderstorm we watched from an eminence above Two Gray Hills. I wanted to tell the couple something about what our old road had let us see, but they were off with their tank full of gas, to collect place names in Colorado like a good trophy recreationist should, ever hurrying over the ever-increasing highways that penetrate lovely country and either lacerate it or pass it by unseen. 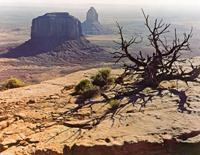 Mitchell Butte from Mitchell Mesa, Monument Valley Navajo Tribal Park, Utah-Arizona, 1963, by Philip Hyde. From Navajo Wildlands, 1967. Do you see Monument Valley now by whizzing past its monuments on a paved road, taking lunch in Tuba City or Kyenta, and spending the night in Moab? Or are its greatest rewards still reserved for those who take the dusty little dirt road that goes down among the great buttes and who feel the rocks and sand under their wheels and feet? I recommend especially the great reward of winter time, when there may be a light skiff of snow in the dune shadows. This reward is even greater if you have also experienced Monument Valley in the heat haze and dust of mid-summer. The crisp winter air is then a special elixir. To me, Canyon de Chelly is another scenic climax of Navajo Country, and at its best in the fall. The cottonwoods lining the canyon’s fields and sandbars glow with their own inner light, and the sun arrives with that low-angled brilliance that drives photographers into ecstasy and exhaustion. Canyon de Chelly is perhaps the most Navajo of all the park areas on the Reservation. It speaks eloquently, in the present tense, of the Navajo and Anasazi past. Here is probably the Reservation’s most spectacularly beautiful combination of colorful rock, canyons, and ancient ruins. You can drive on pavement to its fringe and soon will be able to drive the rims on high-standard highways; but travel in the canyons, where the most exciting visual action is, is subject to nature’s whims. High water, or sand quicker than usual, can stall the most ingenious mechanical substitute for feet. There is still a lot of foot travel in the canyons. The White House Trail that drops over the rim from an overlook on the rim road crosses the wash and leads to the area’s best known ruin, perched on a ledge above the canyon bottom, with a great wall sheer above it. Many museum curators, gallery owners and photo buyers consider the image all important and often overlook the significance of place, even in landscape photography. Do you feel a sense of place is important in landscape photographs? If so, why? Chiaroscurro, Sun Through Fog, Avenue Of The Giants, Humboldt Redwoods State Park, California, copyright 1964 by Philip Hyde. 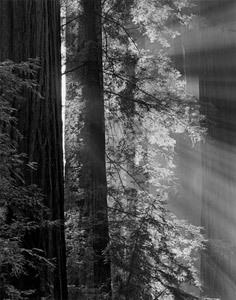 First published in "The Last Redwoods: Photographs And Story Of A Vanishing Scenic Resource," by Francois Leydet with photographs by Philip Hyde and Martin Litton, in the Sierra Club Exhibit Format Series. After seeing Martin Litton’s feature articles in The Los Angeles Times protesting proposed dams in Dinosaur National Monument, David Brower recruited the young journalist to join the Sierra Club and continue the fight against dam building and other wilderness degradation in earnest. Martin Litton and Philip Hyde made the landscape photographs of Dinosaur National Monument that became the Sierra Club book, This Is Dinosaur: Echo Park Country And Its Magic Rivers with introduction and chapter one by Pulitzer Prize novelist Wallace Stegner. The controversy over the dams in Dinosaur National Monument, along with the first quality images of the area brought home by Philip Hyde and eloquent arguments by Martin Litton in Sierra Club Board Meetings, prodded the Sierra Club Board of Directors to decide to expand the interests of the Sierra Club beyond California and the Sierra Nevada. The battle over Dinosaur not only made the Sierra Club a national organization, but also brought the cause of conservation national recognition. A number of conservation groups including the Wilderness Society and others formed a coalition of organizations opposing the Dinosaur National Monument dams. The conservation ideals exemplified by visionaries such as Henry David Thoreau, Aldo Leopold, and John Muir, were combined with new lobbying efforts, grassroots on location campaigning, full-page ads in national newspapers and other methods that became modern environmentalism. “Post-War industrialists in league with the U.S. Bureau of Reclamation found their high water mark when they reached for the Grand Canyon,” Philip Hyde explained in a 2004 interview. “World wide citizen action prevented Big Dam Foolishness from getting a foothold in the Grand Canyon. Dam builder’s influence declined from then on.” Today, there is a world-wide movement to remove dams on major rivers, but in the 1950s and 1960s, conservation groups did not yet have much power. David Brower, leader of the new environmental movement and Executive Director of the Sierra Club, and Martin Litton hatched a plan to stop the Grand Canyon dams. 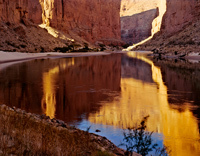 They organized a river trip down the Colorado River through Grand Canyon National Park. The river trip participants included the who’s who of the day in landscape photography, geology, ecology and other sciences and disciplines. Martin Litton acted as lead boatman, Francois Leydet joined the trip as a writer, Eliot Porter and Philip Hyde as photographers, David Brower as filmmaker, to mention only a few. Their creative efforts and scientific observations became the Sierra Club Books Exhibit Format Series book, Time And The River Flowing: Grand Canyon. The book went out to every member of Congress and with other written material circled the globe and caused a worldwide outpouring of support for saving the Grand Canyon. 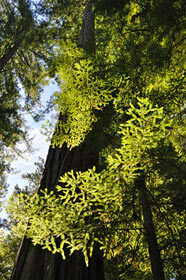 Also on Martin Litton’s list of conservation successes was the making of Redwood National Park. The centerpiece of the redwoods campaign, the Sierra Club Books Exhibit Format Series book The Last Redwoods: Photographs And Story Of A Vanishing Scenic Resource with text by Francois Leydet and photographs again by Philip Hyde and Martin Litton, helped the Sierra Club establish its argument for a Redwood National Park between the California state parks along Redwood Creek where the largest redwoods remained rather than a Redwood National Park proposed by Save The Redwoods League that merely combined existing state parks. Read more on the Redwoods campaign and the making of The Last Redwoods with Martin Litton and Philip Hyde in future blog posts. Martin Litton was the 185th known person to float down the Colorado River through the Grand Canyon in 1955 and founded the company Grand Canyon Dories in 1971. He ran commercial river trips using small oar-powered wooden boats originally used for fishing in Oregon and known as drift boats, but adapted by Martin Litton for use in whitewater and renamed Grand Canyon Dories. Martin Litton wrote the introduction to a number of noted books on the Grand Canyon and other environmentally sensitive wilderness areas and national parks, as well as working as managing editor for Sunset Magazine. During his work for Sunset Magazine, Martin Litton used various made up names in print for his photo credits because Sunset Magazine did not want him to actively participate in controversial environmental campaigns. The mission of the Forest Service is to get rid of all the nation’s forests so they can start over. Under the guise of removing hazardous trees, they are taking out all the dead trees that are serving as homes for woodpeckers and owls. Their credo is to remove trees that are dead, dying, or in danger of dying. That’s every tree in the world… I feel sorry for my grandchildren. The only true optimist is a pessimist. You have to realize how bad things are before you can improve them. Stay tuned for excerpts from my fiery interview of Martin Litton in the next blog post in this series, “Martin Litton: David Brower’s Conservation Conscience 3.” Also in future blog posts read more stories of Philip Hyde and Martin Litton working or traveling together: a river trip up the Klamath River, down the Colorado river, flying over the California Coastal Redwoods, through Grand Canyon National Park. 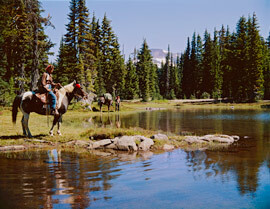 Ardis Hyde On Horseback With Packer Tom McAllister From Portland At Waldo Lake, Oregon Cascades, Oregon, 1969 by Philip Hyde. Heated land use debates in the 1950s and 1960s concerning the forests of the Cascade Mountains in the Northwestern United States, helped define the future of wilderness protection nationwide. While the battle over the dams in Dinosaur National Monument took the national stage sooner, launched the modern environmental movement and set a precedent that would keep industrialists out of the National Park System; the land battles over the lush forests in the Northwestern U.S. began around the same time and cannot be underestimated in their national impact. Decisions in Oregon and Washington State affected forest management policy in the National Forest System more than the National Park System. Nonetheless, the resulting conflicts and their outcomes played a significant role in the eventual forging of the Wilderness Act in Congress and provided a blueprint for grassroots environmental campaigns all over the country, particularly in the West where wilderness came under the greatest threat of desecration by resource exploitation. The main purpose of the post-World War II Forest Service was to supply timber. The policy of multiple use often translated into allowing various uses of public lands, as long as they could co-exist with logging. Lumber companies kept pressure on the Forest Service to provide a guaranteed supply of logs. “An era of stewardship of the nation’s public forests gave way to an emphasis on rapid extraction of timber resources,” wrote Kevin R. Marsh in Drawing Lines in the Forest: Creating Wilderness Areas in the Pacific Northwest . “This spawned a grassroots movement that ultimately challenged the managerial power of the Forest Service.” It was 10 years in the making, but the Wilderness Act of 1964 finally opened the process to citizen participation, giving the public a say in the drawing of wilderness boundaries. Before 1964, small citizen groups had less power, but after 1964, the two opposing forces of industry and conservation shaped the Wilderness System. In the Cascade Mountain Range, a string of volcanic peaks and up thrust rocky crags extending from Northern California through Oregon and Washington and into Canada, many groups played a role—the U. S. Forest Service, the timber industry, recreationists and environmentalists. 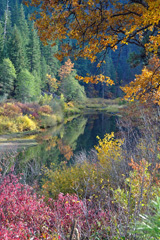 The opposing forces consisted of timber interests and the Forest Service on one side and local groups such as the Obsidians and Chemeketans on the other side, often supported by national environmental organizations such as the Sierra Club, National Audubon Society and the Wilderness Society. When enough national outcry supported the protection of an area, Congressional Law made it official but not without a tremendous fight and wrangling in and out of Congress right up to the final signing as in the case of North Cascades National Park or Olympic National Park. Needless to say, merely obtaining wilderness status for many areas engendered a terrific political and often legal war. Originally in 1893, President Grover Cleveland established the Cascade Forest Reserve encompassing nearly 5 million acres, from Mt. Hood in Northern Oregon to Crater Lake in Southern Oregon, to limit the cutting of mountain forests and to protect watersheds. Aldo Leopold, author of A Sand County Almanac , a pro-wilderness polemic, set a national example as his worked within the Southwest agency of the Forest Service to found the Gila Wilderness in New Mexico in 1924. Forest Service leaders such as Arthur Carhart in Colorado and Elers Koch in Idaho thwarted the inroads of “progress” into wilderness and fostered the agency atmosphere in line with Gifford Pinchot’s vision from years earlier. These new leaders in the 1920s reformed management practices and created Primitive Areas in the National Forests, which limited but did not end industrial use. “The Forest Service would later argue that these boundaries were not meant to be permanent,” wrote Kevin R. Marsh. Friends of Three Sisters became an example for later site-specific grassroots campaigns. At a 1955 Forest Service hearing, local groups from all over Oregon such as The Mazamas, the Obsidians, chapters of the Sierra Club, National Audubon Society groups, Wilderness Society leaders, the Oregon Federation of Garden Clubs, the Mountaineers, Olympic Park Associates, the Izaak Walton League Eugene Chapter, the AFL and CIO unions and many others rallied against reducing the Three Sisters Wilderness. The Forest Service expected a one day hearing but had to carry it into a second days when a total of 79 speakers wanted their turn. 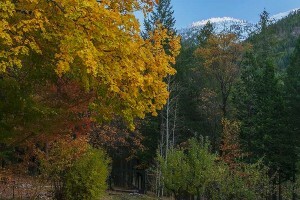 Some voiced concern for retaining recreational space, some for not allowing wilderness to be reduced over and over as in other states, some wanted to protect areas for scientific study, and others thought logging interests could make more efficient use of the existing public and private timber lands. On the second day of hearings, Howard Zahniser, executive director of the Wilderness Society arrived and testified with hints of the language from the Wilderness Act that would not pass Congress until 1964, but that he had already begun to draft in 1955. The Three Sisters campaign was pivotal to the national cause of wilderness preservation as it would set a precedent for whether people had a say when Federal lands were reduced to benefit private industry. David Brower, Executive Director of the Sierra Club corresponded with Karl Onthank to stay informed of developments. David Brower and other Sierra Club leaders contributed to the campaign by writing letters to the media and leaders in Washington DC, just as Ruth and Karl Onthank and their associates were doing. Nationally the tide was high for conservation as the wilderness ideals of John Muir and Henry David Thoreau were hitched to a new environmental movement that employed the media, Congressional lobbying, letter writing campaigns, the courts, full-page newspaper ads and grass root organizing. At first it the purpose was wilderness protection, but later environmental campaigns strived to limit water and air pollution and other environmental destruction brought on by land development, growth and a booming industrial age. In 1955, The Sierra Club published This is Dinosaur: Echo Park Country and Its Magic Rivers, edited by Pulitzer Prize winning novelist Wallace Stegner with photographs by Philip Hyde, Martin Litton and others. A copy of This is Dinosaur landed on the desk of every Congressman just as they were deciding how to vote on the Colorado River Storage Project Bill. David Brower testified in Congressional hearings against the dams and the Sierra Club ran full page newspaper ads warning Congress not to endorse a hotly opposed expensive project in an election year. The new brand of environmentalism worked. The bill passed Congress without the Dinosaur Dams and with a phrase added barring dams in national parks or monuments. Following this national land conservation victory, Three Sisters activists communicated their position with a growing effectiveness that surprised the Forest Service, but as the struggle went on, the Forest Service defined the debate and wilderness advocates had to stay on the defensive. By 1957, the Friends of Three Sisters had lost the battle and the Forest Service went through with their original planned boundaries. The loss confirmed the fears of wilderness proponents across the country but solidified determination to push for a Wilderness Act to prevent “having this kind of battle on every one of the primitive and the limited areas,” said Karl Onthank. Oregon senators responded by sponsoring the Wilderness Act and helping Howard Zahniser and others draft it. The Forest Service decision on the Three Sisters Wilderness, swung support toward the Wilderness Act but years of conflict over it were yet to come. What Is An Environmentalist? What Is A Conservationist? Foliage Illuminated, Big Basin Redwoods State Park, California, 2009 by David Leland Hyde. Camera Raw. Photoshop used only for resizing. Nikon D90, hand held. Without letting our minds complicate or judge these words, here’s a simple definition: an environmentalist is anyone who likes to breathe, drinks water and does not want either one polluted. A Conservationist cares about maintaining the quality of wilderness, the same way everyone else cares about the quality of air and water. The two words are sometimes used interchangeably, though conservation was the earlier version of environmentalism, with particular emphasis on land preservation. Conservation, as practiced by Henry David Thoreau and John Muir, transformed into modern environmentalism, between 1955 and 1975, when political lobbying, advertising, letter writing, grass roots organizing, book publishing and other modern methods evolved, and when activism broadened from wilderness protection into other issues such as, you guessed it, water and air pollution. Lest you doubt that the meanings are truly this simple, check a good dictionary. In the meantime, let us grapple with the idea of ‘environmentalism’ and the ‘environment.’ Is it wise at this time in history, to care about the environment, particularly if you consider yourself an outdoors person, naturalist, nature photographer, or as Ansel Adams called himself and his colleagues, “a photographer of the natural scene”? If the world is going to end anyway eventually, what does it matter if we keep it from ending sooner? If mankind’s time on this green globe is only one very small fraction of an instant compared to how long the rest of it has been around, and is likely to continue, who are we to think we can destroy or save the natural world? Why not forget about environmentalism and use everything up and trash the planet? After all, isn’t the Gross Domestic Product or GDP more important? Making a profit is what counts, right? If GDP grows a few percent, that is good for everybody, if it drops a few percent, we are all in big trouble, right? We could also remember that at some time in our childhood, our mothers taught us to pick up after ourselves, share with others, not hoard all the toys, if you spill something, clean it up or ask mom to help you clean it up, do not just leave it, pack back inside everything you take out, and let everyone have a turn. If we just applied sandbox etiquette to the world, we might get along better and live longer. Was the concept of the environment, as separate from Mankind and the man-made world, the idea of environmentalists? If you are an environmentalist, does it follow that you care about the ‘environment’ and not about people? Those damn environmentalists! They are the cause of our society’s woes, particularly the woes of capitalists just trying to make a living. Are environmentalists against capitalism? Heck, when you get right down to it, are environmentalists un-American? Are environmentalists terrorists? What is an “eco-terrorist”? Is he or she an ecologist-turned-bad? I thought the term terrorist referred to someone who kills people. Do “eco-terrorists” kill people? Or do they just cause inconvenience for resource-exploiting and habitat-destroying industry? By the way, is the habitat being destroyed only that of small endangered species, or is it yours and mine? Let’s see, Webster’s says, “Terrorism: the systematic use of terror especially as a means of coersion.” OK, then what is terror? Webster’s tells us it is,”To frighten. To cause anxiety or worry.” Under these definitions, the news media are terrorists, as are doctors, nurses, especially hospitals, ads for drugs, commercials, law enforcement, a few but certainly not all museum curators, stock brokers, bankers, credit card companies, insurance companies, airport personnel, lawyers, how could I forget lawyers, power-hungry-instant politicians who support big polluters and other big business, librarians, archivists, sometimes relatives and sometimes even neighbors. The world is full of terrorists and there is a lot to be afraid of…? Are environmentalists the worst of all? That’s what some would have you think. Are they really? OK, so let me get this straight, an eco-terrorist is not interested in hurting other people, he or she is more interested in making sure that other people are not hurtful. An Eco-terrorist sabotages activities that damage the factors that determine his or her survival. I can live with that. Fair enough. And an environmentalist works on the positive side of it, an environmentalist is interested in preserving the factors that determine his or her survival. Just wanted to clear up these various meanings, so people didn’t throw around terms that they think are insulting, but are truly complementary. What do you think? Are you an environmentalist? If not, why? Indian Creek Below Indian Valley, 2009 by David Leland Hyde, hand held, Nikon D90. The leap is in motion, off into the open space wilderness of the wild west internet with the other yahoos. Hope you enjoy the ride. It will be WILD. And as you may have heard or read Henry David Thoreau, “In wildness is the preservation of the world.” Henry David Thoreau and the Transcendentalists, we will talk about them. Here’s one blog post, “Ralph Waldo Emerson On Henry David Thoreau.” The transcendentalists were some of Philip Hyde’s favorite writers, along with John Muir, Aldo Leopold, Edward Weston, Alan Watts, Edward Abbey, Mahatma Gandhi and others–see recommended reading below. This blog is for the art lover, the dreamer, the wilderness sojourner who listen for chickadees in the Spring or smells the bark of pine trees, the admirer of beauty, the listener to silence, the person who understands that we cannot keep exploiting the Earth forever, but must somehow come into harmony with our planet’s ecosystems or perish. This blog is for you. Please post comments: Tell me if you could discover new inspiration and information related to, or explore any aspect of, landscape photography and the environment, what would you enjoy reading about?